We invite you to explore India - the Land with infinite beauty ! Whether you soar high into Himalayas or peer under the ruins of the Ancient monuments dotting the landscape of India, you will cherish the experience long after your visit ! This India Travel Guide on Char Dham is free from any commercial interest! This site is dedicated to promote India - the vast subcontinent, its glorious past, magnificent landscape and its infinite variety. India is a land of temples and some are simply more mystical that others, while others are popular destinations of worship. Beliefs run deep and many take on pilgrimages in the belief that prayers will be answered and that their lives will be blessed. One such revered pilgrimage destination in India and perhaps the most important for Hindus are the four temples of the Char Dham. Char Dham translated loosely means 'four sacred spots' and each one of these destinations houses a unique and ancient temple. 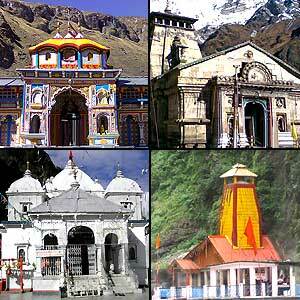 The Char Dham comprises four sites - Yamunotri, Gangotri, Kedarnath and Badrinath. These four holy destinations are all situated in the Himalayan mountain range in the Gharwal section of the northern Indian state of Uttarakhand. The Char Dham represents the important denominations of Hinduism - Shaivism and Vaishnavism. These four sites are also located in such a way that they represent the four earthly directions of north, south, east and west. Another feature of these four sites is that they each receive holy water from tributaries of various rivers. It is believed to be auspicious to visit the Char Dham in a clockwise or left to right direction beginning at Yamunotri and proceeding to Gangotri, Kedarnath and ending at Badrinath. Another oft-visited holy spot enroute is the Hemkund Sahib. The Char Dham in Uttarakhand rest among the Himalayan Mountains making them inaccessible or unsafe during winter months. Thus the best time to Char Dham is between the months of May and October. Travel to these pilgrimage sites should also be avoided during the monsoons due to safety reasons. While the Char Dham themselves are only approachable by road, you will need to head to either Haridwar or Rishikesh to set out on your pilgrimage. Haridwar and Rishikesh are holy destinations themselves and can be reached via road or train from Delhi. From these starting points, various options are available to reach the holy shrines including a helicopter service. If you choose to take the traditional road route, you will need around 12 days to complete the Char Dham Yatra. The temples and centres of pilgrimage of the Char Dham have their own mystical elements, from hot springs to divine calm. When you decide to embark upon this journey, be prepared for difficulties, a tough journey and immense crowds. Also be prepared for spiritual enlightenment and the awe of being able to witness various rituals including the pujas by the river Ganga.